AFTER Pope Benedict XVI relinquished the seat of Peter, I sensed in prayer several times the words: You have entered into dangerous days. It was the sense that the Church is entering into a period of great confusion. 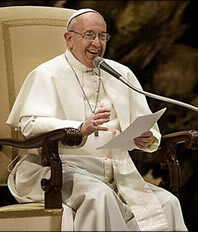 Not unlike Blessed John Paul II’s papacy, our new pope has also overturned the deeply rooted sod of the status quo. He has challenged everyone in the Church in one way or another. 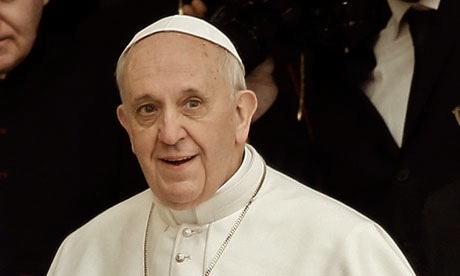 Several readers, however, have written me with concern that Pope Francis is departing from the Faith by his unorthodox actions, his blunt remarks, and seemingly contradictory statements. I have been listening for several months now, watching and praying, and feel compelled to respond to these questions regarding our Pope’s candid ways…. His words were interpreted as being a “radical shift” from his predecessors. Once again, Pope Benedict was framed by several media as the hard, cold, doctrinally rigid pontiff. And yet, Pope Francis’ words are unequivocal: “The teaching of the church… is clear and I am a son of the church…” That is, there is no loosening of the Church’s moral stand on these issues. Rather, the Holy Father, standing on the bow of the Barque of Peter, looking at the sea of change in the world, sees a fresh course and “tactic” for the Church. I see clearly that the thing the church needs most today is the ability to heal wounds and to warm the hearts of the faithful; it needs nearness, proximity. I see the church as a field hospital after battle. 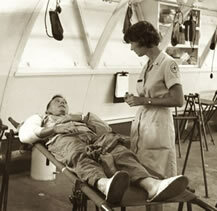 It is useless to ask a seriously injured person if he has high cholesterol and about the level of his blood sugars! You have to heal his wounds. Then we can talk about everything else. Heal the wounds, heal the wounds…. And you have to start from the ground up. —Ibid. We are in the midst of a culture war. We can all see that. Overnight practically, the world has been painted in rainbow colors. “Abortion, gay marriage, and the use contraceptive methods,” have become so quickly and universally accepted, that those who oppose them in the near future likely do face the real prospect of persecution. The faithful are exhausted, overwhelmed, and feeling betrayed on many fronts. But how we face this reality now, in 2013 and beyond, is something the vicar of Christ believes is in need of a fresh approach. The most important thing is the first proclamation: Jesus Christ has saved you. And the ministers of the church must be ministers of mercy above all. —Ibid. The danger, said Francis, is losing sight of the big picture, the larger context. Perhaps that is why Pope Francis refused to be locked up in the “small things” at the beginning of his pontificate when he washed the feet of twelve prison inmates, of which two were woman. It broke a liturgical norm (at least one that is followed in a few places). The Vatican defended Francis’ actions as being ‘absolutely licit’ since it was not a sacrament. Furthermore, the pope’s spokesman underscored that it was a communal prison of both men and women, and leaving the latter out would have been ‘strange’. By his actions, the Holy Father is trying to create a “new balance” as he puts it. Not by neglecting the truth, but re-ordering our priorities. Yes, this is precisely the “fresh breeze” I was referring to in August, a new outpouring of the love of Christ in and through us. cf. Fresh Breeze But “without getting lost”, that is, falling, said Francis, into the “danger of being either too much of a rigorist or too lax.” see the part of the interview under “the Church as Field Hospital” where Pope Francis discusses confessors, clearly noting that some confessors make the mistake of minimizing sin. Furthermore, our witness must take a bold, concrete form. Instead of being just a church that welcomes and receives by keeping the doors open, let us try also to be a church that finds new roads, that is able to step outside itself and go to those who do not attend Mass… We need to proclaim the Gospel on every street corner, preaching the good news of the kingdom and healing, even with our preaching, every kind of disease and wound… —Ibid. Many of you know that several of my writings here speak of the “final confrontation” of our era, of the culture of life vs. the culture of death. The response to these writings has been overwhelmingly positive. But when I wrote The Desolate Garden recently, it struck a deep chord within many of you. We are all searching for hope and healing, grace and strength in these times. That is the bottom line. The rest of the world is no different; in fact, the darker it gets, the more urgent, the more opportune it is becoming to propose the Gospel again in a profoundly clear and straightforward way. Proclamation in a missionary style focuses on the essentials, on the necessary things: this is also what fascinates and attracts more, what makes the heart burn, as it did for the disciples at Emmaus. We have to find a new balance; otherwise even the moral edifice of the church is likely to fall like a house of cards, losing the freshness and fragrance of the Gospel. The proposal of the Gospel must be more simple, profound, radiant. It is from this proposition that the moral consequences then flow. —Ibid. So Pope Francis is not neglecting the “moral consequences.” But to make them our main focus today risks sterilizing the Church and shutting people out. Had Jesus entered towns preaching Heaven and Hell rather than healing, souls would have walked away. The Good Shepherd knew that, first of all, He had to bind the wounds of the lost sheep and place them on His shoulders, and then they would listen. He entered towns healing the sick, casting out demons, opening the eyes of the blind. And then He would share with them the Gospel, including the moral consequences of not heeding it. In this way, Jesus became a refuge for sinners. So too, the Church must be recognized again as a home for the hurting. This church with which we should be thinking is the home of all, not a small chapel that can hold only a small group of selected people. We must not reduce the bosom of the universal church to a nest protecting our mediocrity. —Ibid. This is no significant departure from John Paul II or Benedict XVI, who both heroically defended the truth in our times. And so has Francis. So blared a headline today: “Pope Francis blasts abortion as part of a ‘throw away culture'” cf. cbc.ca But the winds have changed; the times have changed; the Spirit is moving in a new way. Isn’t this in fact what Pope Benedict XVI prophetically said was needed, moving him to step aside? Several commentators erroneously concluded that the Pope was suggesting that atheists can simply get to Heaven by good deeds cf. The Washington Times or that everyone is saved, no matter what they believe. But a careful reading of the pope’s words suggest neither, and in fact, underscore that what he said is not only true, but also biblical. While everyone has been redeemed through Christ’s blood, not all are saved. Or putting it in St. Paul’s terms, all have died, but not all choose to rise to a new life in Christ to live “no longer… for themselves but for him…” Instead, they live a self-centered, selfish life, a wide and easy path that leads to perdition. Every human being is created in the image of God, in the image of love, therefore, we all have ‘this commandment at heart: do good and do not do evil.’ If everyone follows this commandment of love—whether he is a Christian or an atheist and everyone in between—then we can find the path of peace, the path of ‘encounter’ where true dialogue can occur. 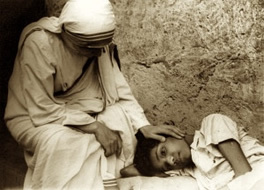 This was precisely the witness of Blessed Mother Teresa. She did not discriminate between Hindu or Muslim, atheist or believer lying there in the gutters of Calcutta. She saw Jesus in everyone. She loved everyone as if it was Jesus. In that place of unconditional love, the seed of the Gospel was already being planted. This is a far cry from saying we will all meet in Heaven—Pope Francis did not say that. But if we choose to love one another and form a moral consensus on the “good”, that is indeed the foundation for peace and authentic dialogue and the beginning of the “way” that leads to “life”. This is precisely what Pope Benedict preached when he warned that the very loss of a moral consensus spelled not peace, but disaster for the future. Those words rang around the world like a cannon. The pope was asked about what has been called a “gay lobby” in the Vatican, allegedly a group of priests and bishops who are actively homosexual and who cover up for one another. Evangelical Christians and gays alike took these words and ran with them—the former suggesting that the Pope was excusing homosexuality, the latter, approving. Again, a calm reading of the Holy Father’s words indicate neither. First of all, the Pope distinguished between those who are actively gay—the “gay lobby”—and those who are struggling with the homosexual orientation but are “seeking God” and who are of “good will.” One can’t be seeking God and of good will if they are practicing homosexuality. The pope made that clear by referring to the Catechism’s teaching on the subject (which apparently few bothered to read before commenting). The Catechism explains the nature of homosexual activity “very well.” But it also explains how a person of “good will,” who is struggling with their sexual orientation, is to be approached. The Pope’s approach directly echoed this teaching. Of course, without giving this context in his statement, the Holy Father did leave himself open to misunderstanding—but only for those who did not reference the Church’s teaching that he directly pointed to. In my own ministry, through letters and public talks, I have met gay men who were trying to find healing in their lives. I remember one young man who came up after a talk at a men’s conference. He thanked me for speaking about the issue of homosexuality with compassion, not damning him. He desired to follow Christ and to recover his true identity, but felt isolated and rejected by some in the Church. I did not compromise in my talk, but I also spoke about God’s mercy for all sinners, and it was Christ’s mercy that moved him deeply. I have also journeyed with others who are now serving Jesus faithfully and no longer in the gay lifestyle. These are the souls who are “seeking God” and of “good will”, and they should not be judged. 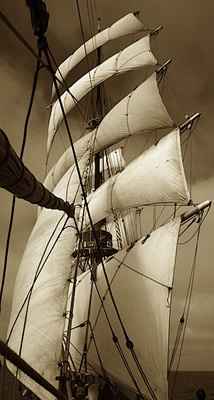 There is a new wind filling the sails of the Barque of Peter. 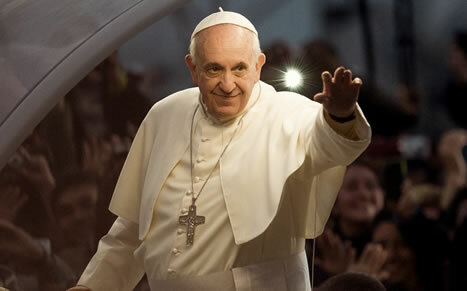 Pope Francis is not Benedict XVI nor John Paul II. 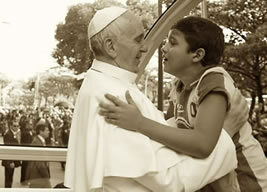 That is because Christ is directing us on a new course, built upon the foundation of Francis’ predecessors. And yet, it is not a new course at all. It is rather authentic Christian witness expressed in a new spirit of love and courage. The world has changed. It is hurting, immensely. The Church today has to adjust—not abandoning her doctrines, but clearing the tables to make way for the wounded. She must become a field hospital for all. We are being called, as Jesus did to Zacchaeus, to look our perceived enemy’s in the eye and say, “come down quickly, for today I must stay at your house.” cf. Come Down Zacchaeus, Luke 19:5 This is the message of Pope Francis. And what do we see happening? Francis is attracting the fallen while shaking the establishment… just as Jesus shook the conservatives of His day while drawing the tax collectors and prostitutes to Himself. Pope Francis is not moving the Church away from the battle lines of the cultural war. Rather, he is now calling us to pick up different weapons: the weapons of modesty, poverty, simplicity, authenticity. By these means, presenting Jesus to the world with an authentic face of love, healing and reconciliation have a chance to begin. The world may or may not receive us. 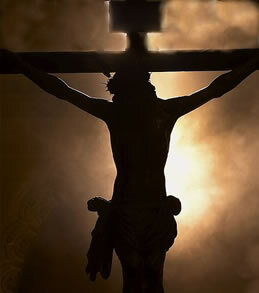 Likely, they will crucify us… but it was then, after Jesus breathed His last, that the centurion finally believed. Thanks for your support of this full time ministry. 4. ↑ see the part of the interview under “the Church as Field Hospital” where Pope Francis discusses confessors, clearly noting that some confessors make the mistake of minimizing sin. Posted in HOME, FAITH AND MORALS and tagged jesuit, john paul ii, jesus, church, catholic, pope, benedict, mercy, abortion, gays, media, francis, radical, conservatives, liberals, progressive.